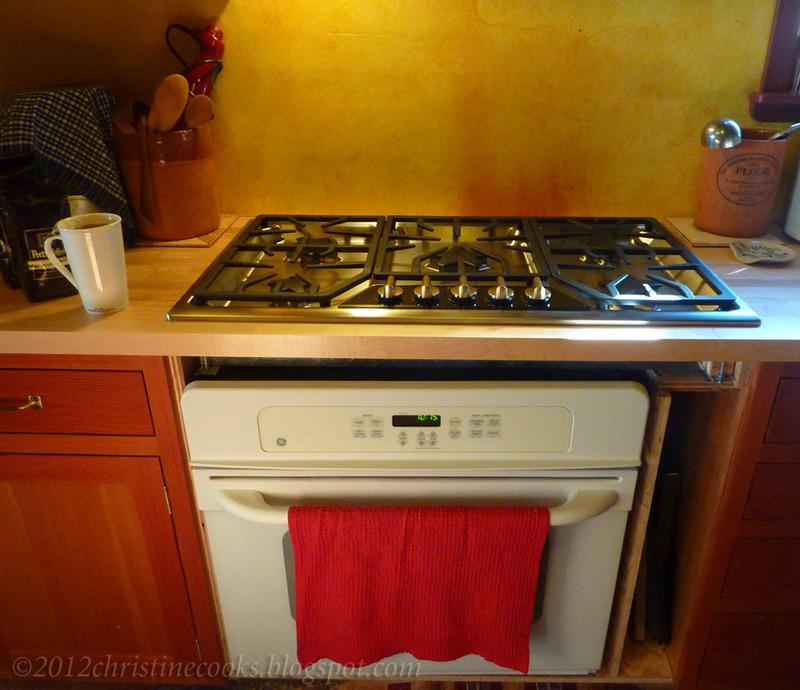 Christine Cooks: The Old Wedgewood Ain't What She Used to Be; The New Thermador Cooktop Is All That and More! 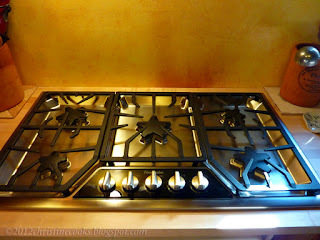 The Old Wedgewood Ain't What She Used to Be; The New Thermador Cooktop Is All That and More! Although the installation is not quite finished, my sister Cynthia asked for photos of my new cooktop so I am obliging her wishes. As you may notice, the cabinetry around the oven is not finished, but will be soon. This 5-burner cooktop by Thermador has a btu range of 400 to 18,000. It totally rocks. And I am totally smitten. See the brown scorch on the wall behind the cooktop? That was made over the years by my beloved old Wedgewood stove, which went from zero to 500-degrees in 60 seconds flat, and which, even with its idiosyncrasies, I had a hard time parting with. But time it was; either the house would burn down or we would get a new stove. We opted for the stove. 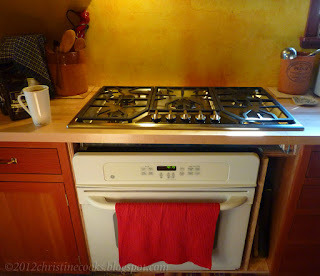 A brushed stainless steel plate will cover the wall behind the cooktop, making it all pretty and professional looking. And yes, I am cooking but haven't been up and running, or at home, long enough to post a recipe. I love my Thermador. I bet you will love this! Congratulations, Christine! It looks like a beauty. I'm craving an AGA, but I won't be getting one anytime soon. How pretty.... Congratulations! So exciting to get a new toy! Look forward to great things. Thank you for stopping by! I will do my best to respond to your comments and questions so feel free to write to me here. Sorry for the comment moderation but it helps to keep the spammers at bay. Copyright 2005-2018 by Christine Hills. All rights reserved.